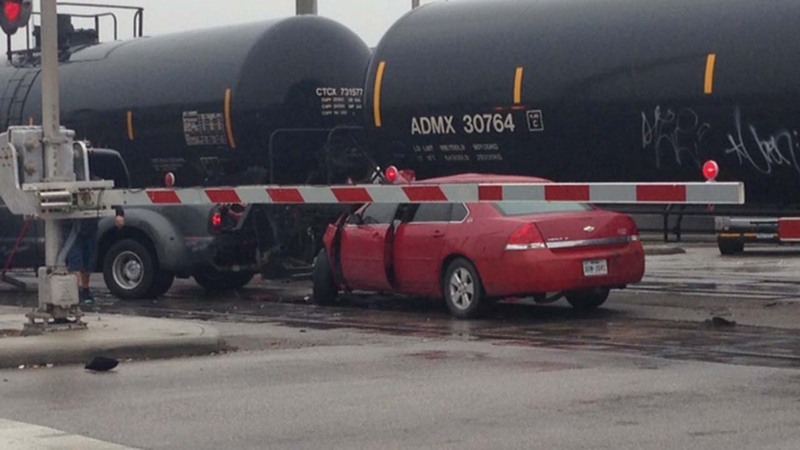 HOUSTON (KTRK) -- A Houston fire official has confirmed a train hit two vehicles in southwest Houston this afternoon. The crash happened around 1:45pm in the 13300 block of Fondren at South Main. According to officials, a train stopped on the tracks and people frustrated with the train arms being down at the intersection began to lift them up so vehicles could cross the tracks. A second train on a second set of tracks came through the intersection and struck two vehicles that were crossing. One of those vehicles had two adults and six children inside; they were taken to the hospital with no serious injuries. The other vehicle hit had one adult inside who was taken to the hospital as well with no life threatening injuries. There is no word on whether anyone will be ticketed. The people who held up the railroad crossing arms left the scene after the wreck.